K-8 Schools in Princeton currently use slow and unreliable T1 connections and bringing fiber to the students is a high priority. High school students attend in a nearby consolidated school. Often prospective families tour the local school and are thrilled to see small class sizes and an intimate setting. "When they learn that there is no high speed Internet for their children, you never see them again," says Moss. While not set in stone, The Massachusetts Broadband Initiative (MBI) plans to bring its middle mile network to the local Thomas Prince School. The public library, the town hall, the public safety facility, the senior center, and the municipal light department will likely also be connected through MBI. Princeton's Broadband Committee wants to use that momentum to get households connected and capitalize on the benefits of ubiquitous access. Real estate professionals in Princeton expect a direct benefit from a fiber network. They attribute lower property values in Princeton, in part, to the lack of high speed connectivity. There are a number of prospective telecommuters and home based businesses who have also spoken out in favor of a municipal FTTH network. One entrepreneur in Princeton who would like to work out of his home, spends $2,000 on office space in another city just to have productive Internet speeds. 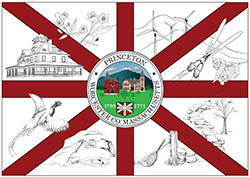 Princeton is looking to Leverett, Massachusetts, as an example. (Btw, Princeton is not the first community we have encountered watching Leverett's process - way to go Leverett!) The Broadband Committee sees similarities between Princeton and Leverett and has watched the rural community as it move ahead. Both are rural, tree covered, hilly, and charming says Moss. "When I see some one new in town I ask them how they come to move to Princeton because you don't end up here by accident." We believe we can do this for even less than people are paying right now for Internet, said Kowaleski. “If the town funds it with a municipal bond we could have this in place by January 2015,” he added. The committee is estimating monthly cost for fiber to the home would be $63.30. With a 20-year bond to pay for the buildout, the cost for the average homeowner (based on a home valued at $303,280) for taxes would be $284.90 per year, for a 20- year average. According to the committee, the average cost today for subscribers for the Internet and phone bill is between $101 and $130, depending on whether the user has satellite, DSL or wireless. The new network cost would be $63.30 per month, plus $25.27 per month for the tax cost for the bond, for a monthly cost of $88.57. While there may be some similarities with Leverett, Moss notes that Princeton has fewer more households over twice as many road miles, creating a more sparsely populated community. Fortunately, it also has an advantage not found in Leverett - a chance to hang their cable expeditiously. Moss tells us that Princeton has worked with the local municipal light plant to reach an arrangement to speed up the process. Leverett has to wait for Verizon to prepare poles for the new fiber, estimated to take six to twelve months. Princeton's municipal light plant will allow fiber optic cable to be hung in the places reserved for power line attachments. At the Monday, March 11 meeting, committee chairman Steve Cullen told selectmen that committee members and volunteers will do the work, saving taxpayers as much as $50,000. “We have the technology to do this,” said Cullen. “We’ll look at every single road and utility pole, take photos and bring the information to an engineering company to cut back on the time line.” Documenting the poles accounts for approximately 60 to 70 percent of the expense related to design costs, said Cullen. The next step will be a series of community meetings to report the results of the survey. Moss expects the Broadband Committee will approach residents at the May 14th Town Meeting where they will ask for approval to fund a network design. Moss is optimistic and believes the city may be hanging fiber optic cable as early as October. Regardless of what approach they take, the people who live there are hungry for something better. We found one survey question and the results especially revealing. When asked "What Internet speed would prompt residents to change Internet providers?," 60% of respondents answered, "Any speed, as long as it's faster."